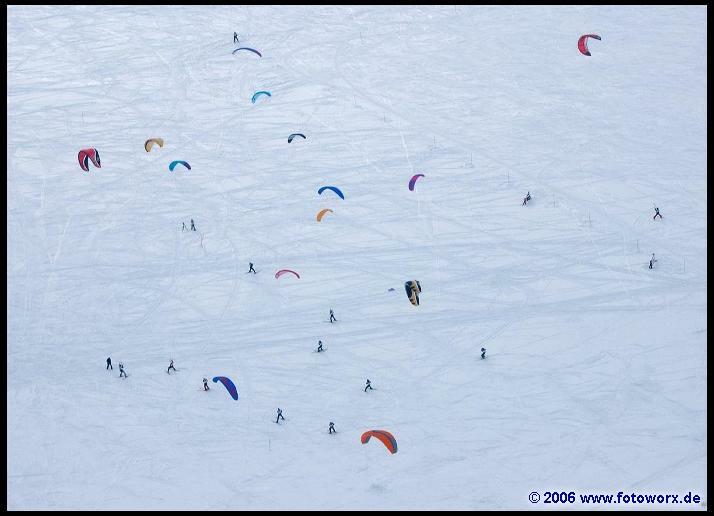 Welcome to the 2006 Snowkite World Championship in Vadsø. 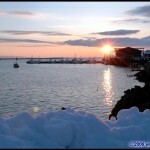 The riders are now competing for the world championshiptitle in Vadsø, and the conditions are perfect. 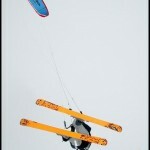 Varanger has perfect conditions for snowkiting. Long winter season and large snowy mountain plateaus combined with lots of wind are the important elements which makes Varanger to one of the best spots in the world for snowkiting. 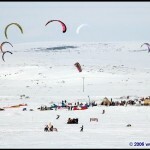 Last winter Varanger hosted the third round of the Norwegian Snowkiting cup. 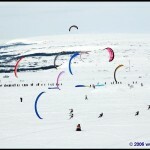 Kiters from around the world visited Varanger during these events. All participants really enjoyed kiting in Varanger both because of the perfect conditions and of the unique location far north. 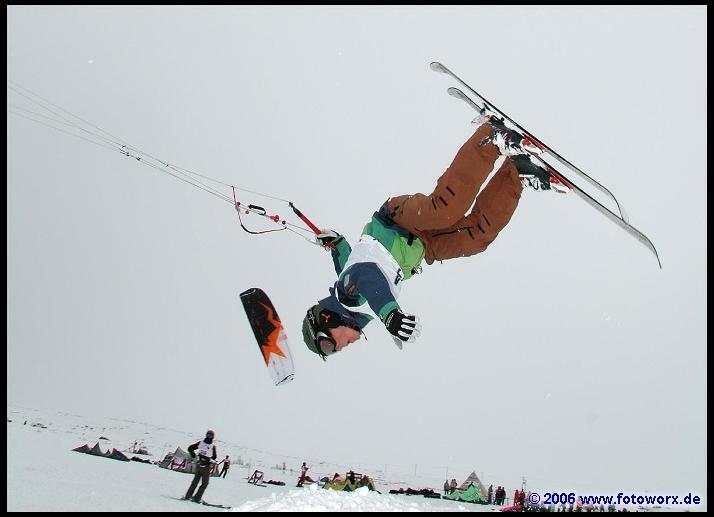 No competitions on the first event day – typical April weather brought the whole range of conditions but just not enough wind – 35 snowkiters from 9 countries participating. 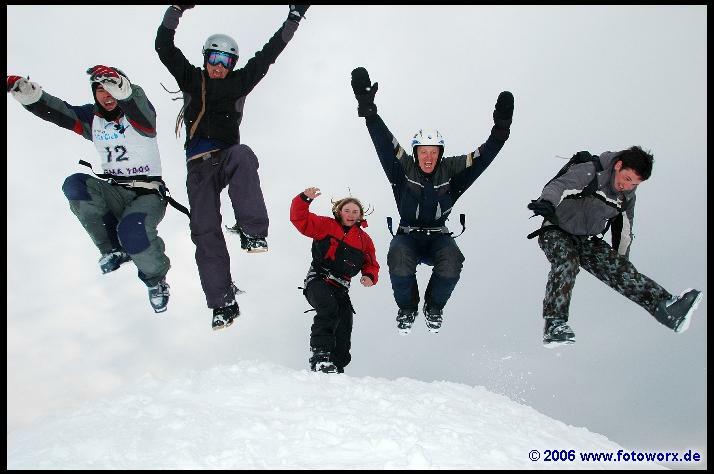 Vadsø presents itself as one of the best spots for snowkiting offering an incomparable wide and ample countryside. The favourite riders in the various disciplines are: Ivo Bryner & Roger Knechtle (both SUI), André Natland (NOR) & Florian Jellinek (GER) as well as Bjørn Kaupang (NOR). 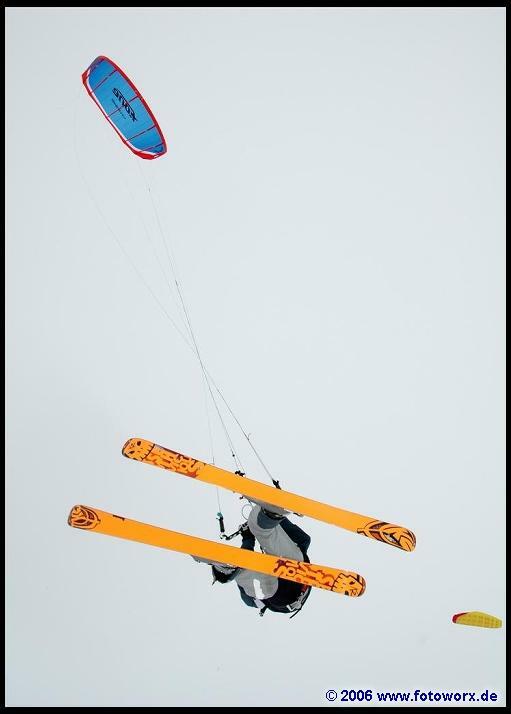 The first day of the Snowkite World Championship in Vadsø, Norway, saw typical April weather just like it is known from central Europe at this time of the year – clouds, snowfalls and sunshine were alternating during the day. 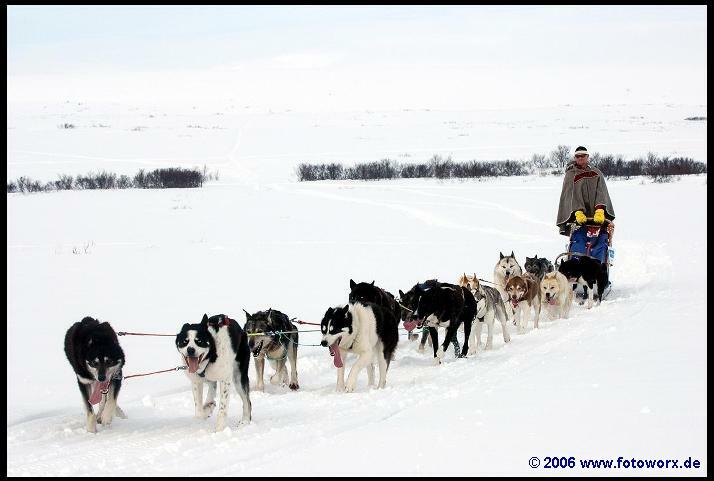 Due to the weather forecast it was decided in the morning to only hold the race competitions, yet in the course of the day those plans had to be cancelled. So the riders are eager to race tomorrow. In the race competitions the riders – all starting at the same time – can do as many heats as possible within a certain time frame. All heats of all event days are counted together which gives the participants quite a lot chances for a great final result. Here in Vadsø the race competitions will be especially exciting for the athletes as the course leads through wide and untouched nature. 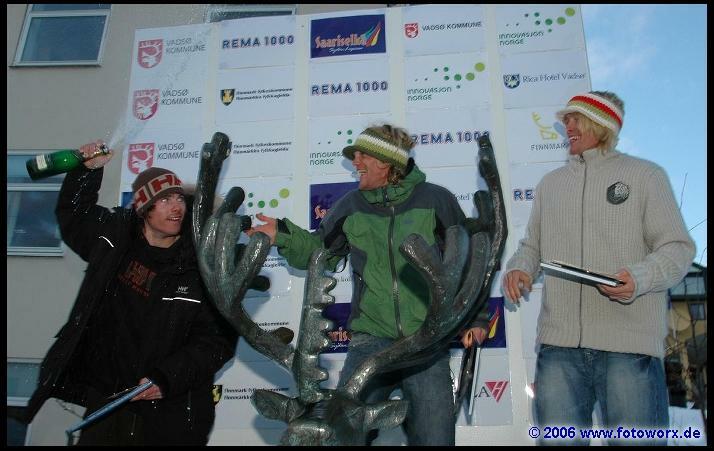 In Race Ski, Ivo Bryner /SUI (33 years, leader of the overall ranking 2006, 1st place Austrian Open 2006, 1st place German Open 2006) and Roge Knechtle/SUI (32 years, third in the overall ranking 2006) as well as the Russian riders Alexey Razhev/RUS (40 years) and Oleg Cherkashin/RUS (18 years) – with places 8 and 16 in the overall ranking 2006 the best Russian riders – are the top favourites. 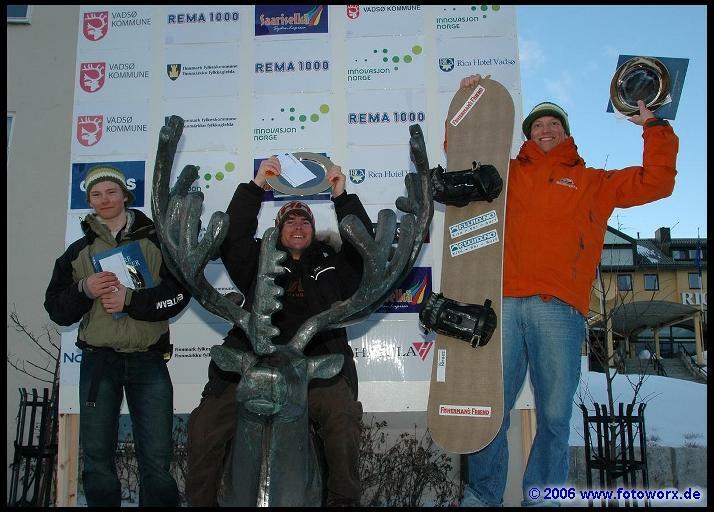 Strong performances in Race Snowboard can be awaited from André Natland/NOR (24 years, in the overall Snowboard rankings 2006, leader in Race and 3rd place in Freestyle, 1st place Kitestyle.ch Silvaplana 2006) as well as Florian Jellinek/GER (28 years, 1st place German Championships). 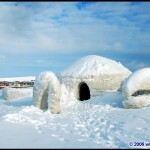 Vadsø, the resort of 6,000 inhabitants in the region Varanger, is located in the northeast corner of Norway. 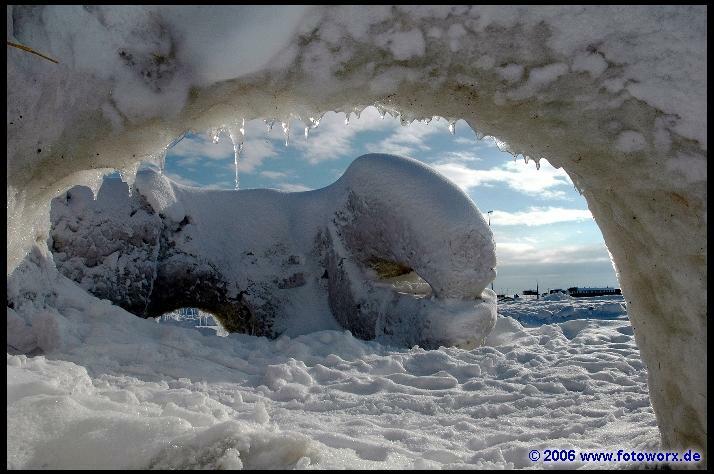 It is the region with the Arctic Ocean as the major natural jewel and its unbelievably huge King Crabs which made it famous. 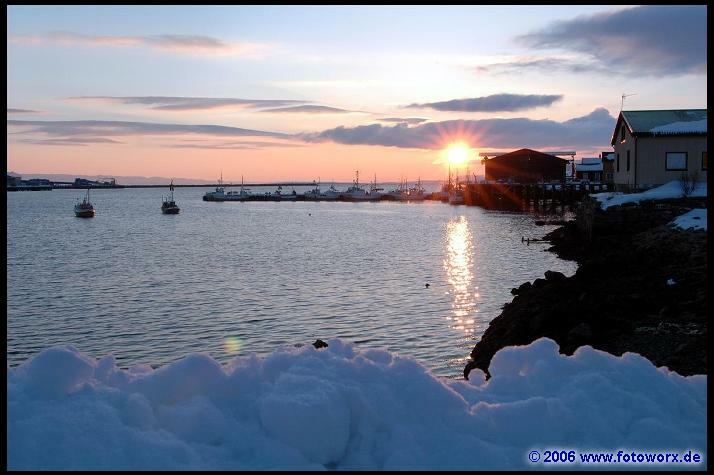 It is the region with the dancing Norther Lights and its broad horizon, and it is also the region with the endless possibilities for exploring nature and all kinds of outdoor sports. You see the great and unique possibilities for snowkiting here in Vadso at once. Perfect wind conditions today in Vadsø – heats in 3 disicplines: Race Ski & Snowboard & Freestyle Snowboard – Norway most successful so far – riders leading: Geir Norland/NOR and André Natland/NOR. 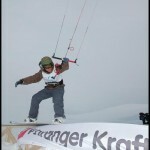 Day 2 of the Snowkite World Championship saw perfect conditions for both the racing and the freestyle disciplines. A lot of people assembled around the event area to watch the performances of the competitors from all over the world, even from far away countries like USA and Canada. But the one participant who had to longest journey to Norway is Fernando Dulce from Argentina. Two heats in Race Ski were run today. One heat lasts for 30 minutes, the rider who has done the most rounds wins. The snow cover on the ground being not really thick, made racing at such high speed a real challenge for the riders – and even more for the material! 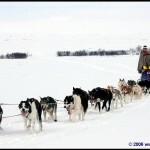 Geir Norland of Norway finished both heats on top positions which gave him the lead after this first competition day. Russian Oleg Cherkashin ended up on place 2. Highly exciting also in terms of the World Cup 2006 is the “fight” between Roger Knechtle and his compatriot Ivo Bryner (both of Switzerland). The World Championship races also count for World Cup. Bryner is still in the lead in the World Cup but has to be careful not to loose this position as Knechtle finished today ways ahead of Bryner on 3rd place. Surprising result for Nils Arne Ro/NOR who finished on place 5. The Norwegian dominating: One of the favourites, Norwegian André Natland, fully lived up to expectations and took the lead today. 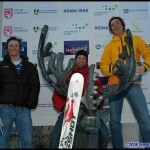 Norwegian Daniel Hallanger and Alexander Yrvum took second and third place respectively. 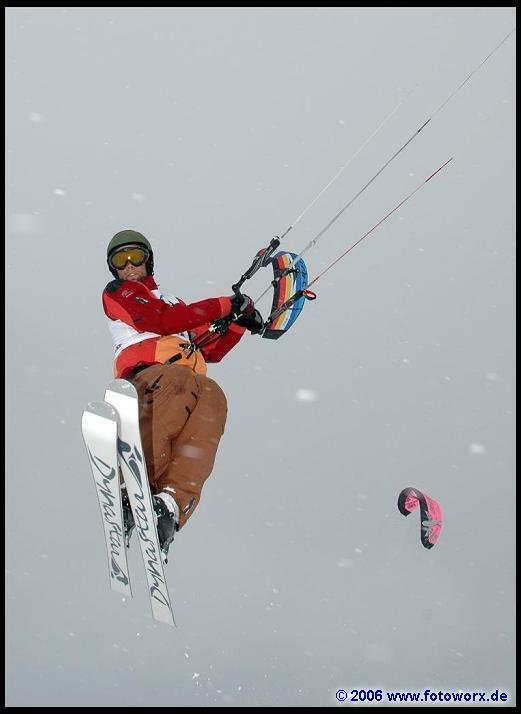 German Florian Jellinek was not lucky: two of his kites were burned at a heater during the night, and in the first heat his bindings broke. Jellinek now has to give everything in the upcoming heats if he wants to finish on a top podium position. In the afternoon the freestylers showed some really stunning tricks on the ramps, rails and kickers. 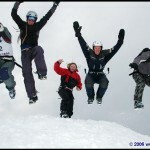 Both the snowboarders and the skiers took the challenge head to head in groups of two. After three heats, the semi finals will be run between Jabkub Bucianic (USA) and André Natland (NOR). 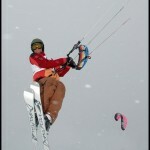 The Snowkite World Champion title in Snowboard will either go to Claes Lundin (SWE) or Sigve Botgen (NOR). 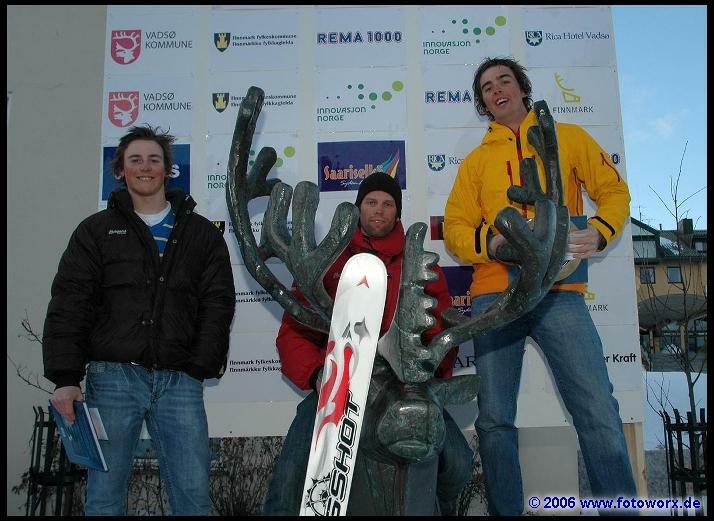 Not that strong but quite consistent wind – Norway dominating Freestyle Ski & Race Snowboard – three different nations in the lead in Race Ski – youngest participant and reigning Junior World Champion at the same time, Norwegian Arne Dokken, placed 3rd in Freestyle Ski. 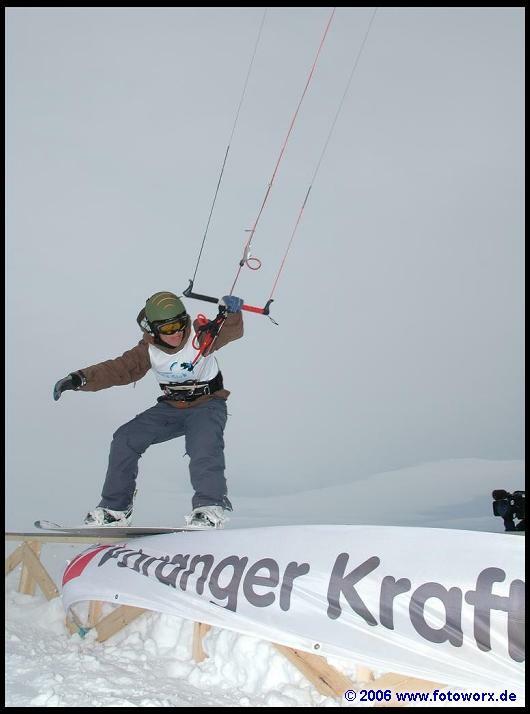 Day 3 of the Snowkite World Championship foresaw a full programm with 5 competitions in the morning, and except the planned second heat in Freestyle Ski all competitions were held. The wind being not too strong ment an advantage for some of the participants in the race events. Today’s heats in the Race Snowboard saw no changes regarding the top 3 positions. That means the Norwegians are still dominating, with André Natland on 1st, Daniel Hallanger on 2nd and Alexander Yrvum on 3rd place. As far as it looks now, Natland will be able to finish the World Championships on a top position and with that will also be able to defend his leading position in the World Cup ranking. Heat number 3 was again kind of a “horror show” for Russian Alexey Razhev. Yesterday he already was in the lead for quite a long time and then messed it up. And he did it again today: he was in the lead for a long time, went the wrong way and the riders close behind him passed. 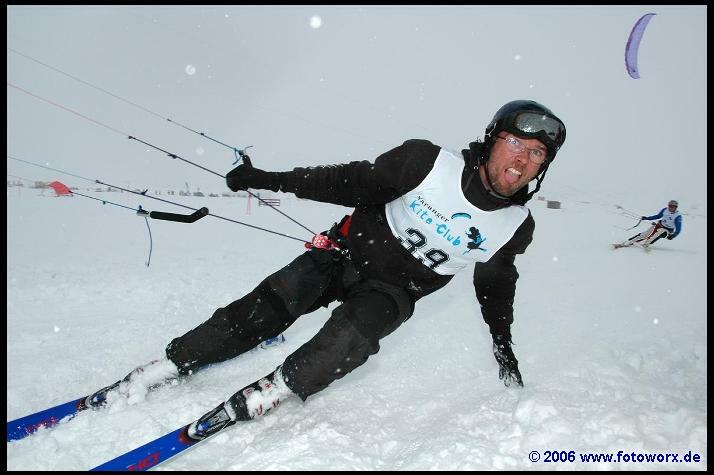 This mistake threw him back to place 5 and allowed Roger Knechtle (SUI) to finish first. With this victory today, Knechtle took over the lead in the actual ranking. Additionally, this pushes him further towards the World Cup 2006 title which, in case he keeps competing that strong, he might take over from Ivo Bryner (SUI). Place two hasn’t changed yet. It is still Oleg Cherkashin’s (RUS) place. 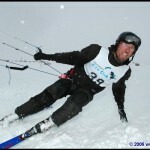 Geir Norland (NOR) has lost two ranks and is now on place 3. 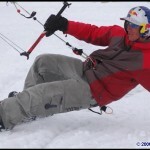 Snowkiting is an outdoor sport where you need wind. At a contest the wind conditions need to be constant to have a fair competition. A World Championship can only be held within a certain number of days. Therefore it can happen that not all races can be held. The World Championship in Norway only saw two days of competition. On the first and on the last day there was not enough wind. So the World Champions in the race disciplines are awarded only after three runs, the freestylers will get their titles after one elimination-session. Altogether the riders in race on skies and snowboard did three runs each on the two competition day. The competition rules say that already three runs can count as a World Championship even though normally in contests the riders have to compete in five runs each. 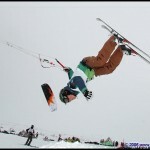 In Freestyle the riders have to show as many tricks on rails, ramps and kickers a possible within a certain timeframe. Quantity and quality of the jumps are rated by judges. In Freestyle Ski after one completed session Anders Bjørtuft (NOR) takes over the title from last years World Champion Bjørn Kaupang(NOR), who is second after a bad final run. On third place is last years Junior World Champion Arne Dokken from Norway. The new World Champion in this discipline is from Sweden. 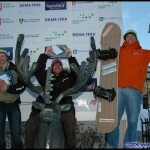 Claes Lundin wins the Freestyle Snowboard competition, second is Sigve Botnen, third André Natland – both are from Norway. 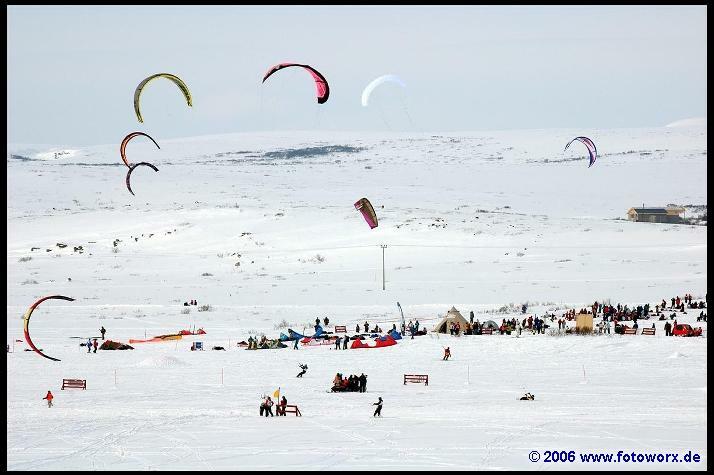 Vadsø – a small quiet spot in Northern Noway – has been the center of the international snowkite scene for the past four days. Here the World Champions in the four disiplines Race Ski, Race Snowboard, Freestyle Ski and Freestyle Snowboard were awarded. 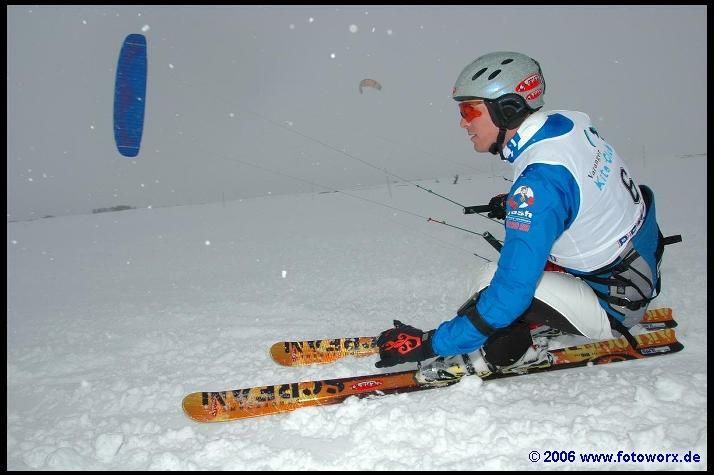 The wind conditions allowed competing only on two days, and still this situation did not at all affect the atmosphere amongst the snowkiters from nine nations. Obviously, a lot of snowkiters from Norway showed up at the World Championship in their home country. 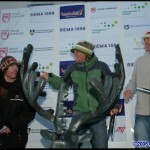 The Norwegian kiters took two of the four World Champion titles, one title went to Switzerland and one to Sweden. On the first event day there was not enough wind for kiting in general and thus not enough to guarantee fair competitions but the sun was shining. Day two as well as the day three brought wind and snowfalls, on the fourth day the heats had to be cancelled due to lack of wind. 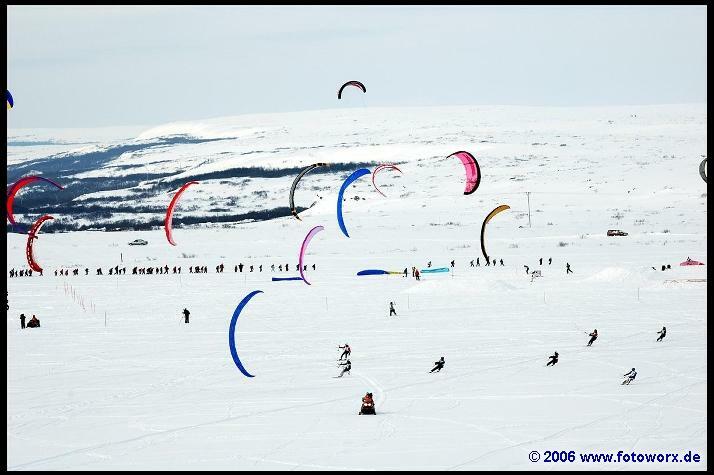 The wide landscape in Vadsø and surrounding is perfect for kiting. Here you can kite in untouched nature for days, and you can also do your tricks on natural jumps. Athletes love this area. These facts make the spot the perfect host of the World Championship. 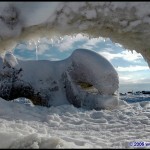 The location is well-known for its constant wind conditions, and still it can happen that wind is missing now and then – like the situation was on two World Championship days. Nonetheless it was possible to run the minimum amount of heats in the four disciplines and award the World Champions. In Race, the winners on skis and snowboards were known after three heats, in Freestyle after one elimination session on snowboard and one on skies the winners were clear. Besides the action on the event area, the small town Vadsø offered a mixed side-program to the kiters – snowmobiling and dog sledging, a traditional sauna and two huge kiter-parties with local bands and Dj’s were some of the highlights. 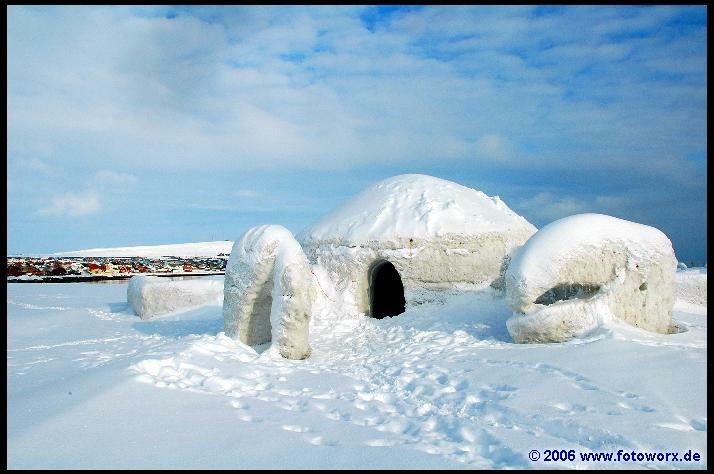 All the inhabitants of Vadsø were somehow involved in the World Championship and did everything to provide a great and lasting event for the snowkiters. 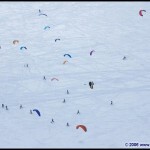 visit the Arctic Kite Challenge website or email Irene Walser directly. 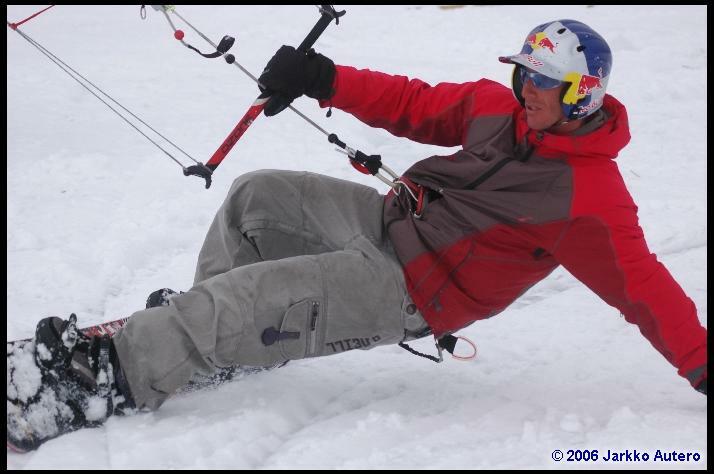 This entry was posted in 2006, Competition, Events / Festivals, General Topics, Issue 48 (May/Jun), KL Archive and tagged board, competition, power kiting, ski, snowkite, sport.